White House says bill is full of "poison pills" that show "lack of seriousness"
WASHINGTON (CNN) -- The White House slammed an energy bill that the House of Representatives passed Tuesday night, calling it a waste of time. The White House says a House bill that would allow more offshore oil drilling showed a "lack of seriousness." The administration accused House Democrats of lacing the bill with "poison pills" that demonstrate a "lack of seriousness about expanding access to the vast domestic energy resources" off U.S. coasts. President Bush and Democrats have been tangling for months over drilling offshore in an area known as the outer continental shelf, which had been placed off-limits both by Congress and executive order for decades. Bush lifted the executive order this summer as oil prices shot up and gas prices reached record levels at the pump. But the legislation includes a number of provisions Republicans do not like, including a repeal of tax cuts for the oil industry and a lack of incentive for states to allow drilling off their shores. "Many of the other provisions contained in this bill are taken from other House bills that failed to pass through the Congress, or have been subject to veto threats," the Executive Office of the President said in a statement Tuesday night as the House voted on the bill, officially known as House Resolution 6899. "If H.R. 6899 were presented to the president, his senior advisers would recommend that he veto the bill," the White House said. Bush may never have the chance. The Senate is unlikely to take up an energy bill before next week, and it is unclear whether there is enough time left in this Congress for the two houses to hammer out a mutually acceptable compromise to send to the president. Fifteen Republicans crossed the aisle to support the bill Tuesday. Thirteen Democrats voted against it. 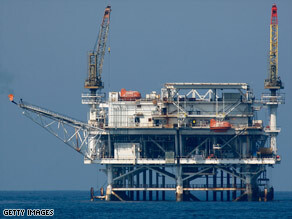 The bill would allow drilling between 50 and 100 miles offshore, as opposed to the 3-mile line favored by Republicans. It would require states to give their permission for drilling off their shores. It also would include incentives for renewables, require the government to release oil from its emergency reserve and force oil companies to drill on federal areas they already lease from the government. House Speaker Nancy Pelosi, D-California, told reporters Tuesday: "The American taxpayers have been ripped off for years on offshore drilling. This bill changes that." She contrasted "the status quo, which is preferred by Big Oil" and the Bush administration, with "change for the future to take our country in a new direction." She insisted that Republicans "must set aside their drill-only mentality." Rep. Mike Pence, R-Indiana, said before the vote that the Democratic bill was "a charade," denying it would do what its backers claim. "This is not 'yes' to drilling. This is 'yes, but,' " he argued. "This is 'yes, but no drilling in Alaska, no drilling in the Eastern Gulf, no drilling inside 50 miles.' This is 'yes, but no litigation reform that will prevent radical environmental attorneys from tying up leases even before a single shovel of dirt is turned.' "
CNN's Elaine Quijano, Ted Barrett and Deirdre Walsh contributed to this report.